We are buying a new build house, we start this before we knew we were now going to Baku, but we are going ahead with it as we want a UK base to come back to during holiday’s and so that it is all ready when we do return. We got to have a look round a couple of weeks ago and everything is look good. Gregor’s bedroom, a bit jealous – I think he has the nicest room in the house. Another one of Gregor’s room. Richard’s workshop, which is also in the attic. He also has a huge cupboard. Our bedroom, check out that tiny radiator. Katrine’s room, and me leaning with my sore head! No idea why we didn’t take any photos from the downstairs! As you can see all the rooms have been plastered and the lights have been fitted – they won’t be dangling down but recessed into the ceiling. Every room has these LED lights, which are very energy efficient but not sure how they will look and feel, how much atmosphere will they give? Downstairs has underfloor heating while the upper two floors have radiators and they are really small. I’m guessing that this is because the house is very energy efficient and quite air-tight, we have a mechanical ventilation system as there are no vents on the windows. Whilst everything is looking great there has been a delay in getting all the services installed, which is going to delay us being able to move in! The new date is the end of June. Which is very close to our move date to Baku, which is very frustrating as I really wanted to be able to settle into our new home before we had to head off travelling again. But, that’s what happens when you buy a new build and I’m sure we will still get to enjoy this new house soon. Buying a house and moving can be very stressful but there are some parts that are fun as well. 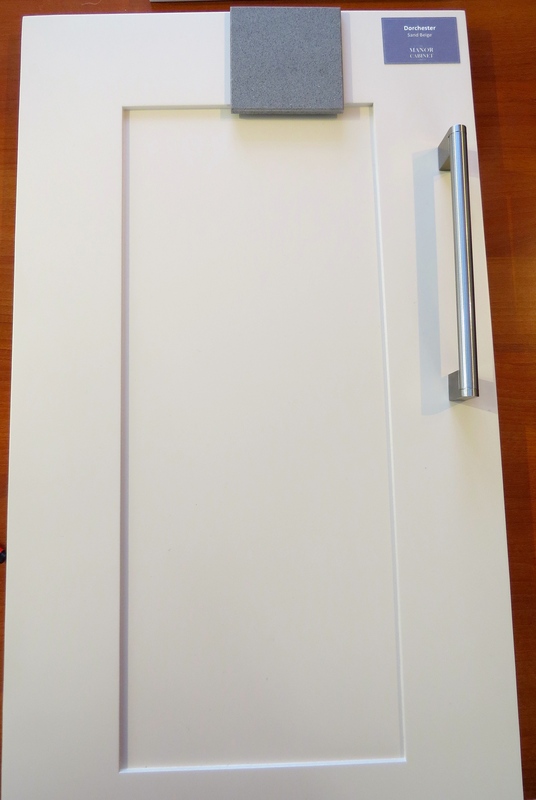 As we are buying the new house off plan we have been able to alter the layout a bit and we get to choose finishing details – and last week Richard and I went and picked the kitchen doors. Several different shade of cream with a light grey. The photo isn’t being very fair, there was more difference between the colours that is showing up and I am sure if we really wanted a different colour we could have discussed it. 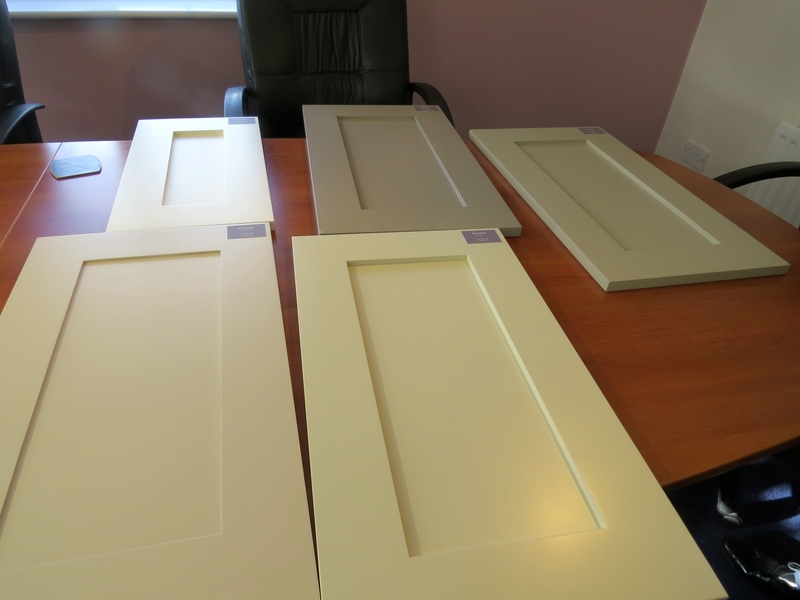 So we choose cream, well technically it is called Sand Beige, with a grey reconstituted stone worktop. I’ve not had a worktop of reconstituted stone before, which (I think) is made from quartz bound together with a resin. it seems to have a lot of the advantages of solid stone but without some of the downsides (it is not porous so you can spill lemon juice on it). It will be interesting to see the finished product. We don’t have to make any more decisions right now, the next ones will be bathroom wall and floor tiles and the carpets.